The Office of Qualifications and Examinations Regulation (Ofqual) regulates qualifications, examinations and assessments, and has recently replaced its Qualifications and Credit Framework (QCF) with a new framework for developing and regulating qualifications in England, Wales and Northern Ireland – the Regulated Qualifications Framework (RQF). The new framework was launched by Ofqual on 1 October 2015 and is designed to help people understand qualifications, providing detail on the challenge and size of each qualification. 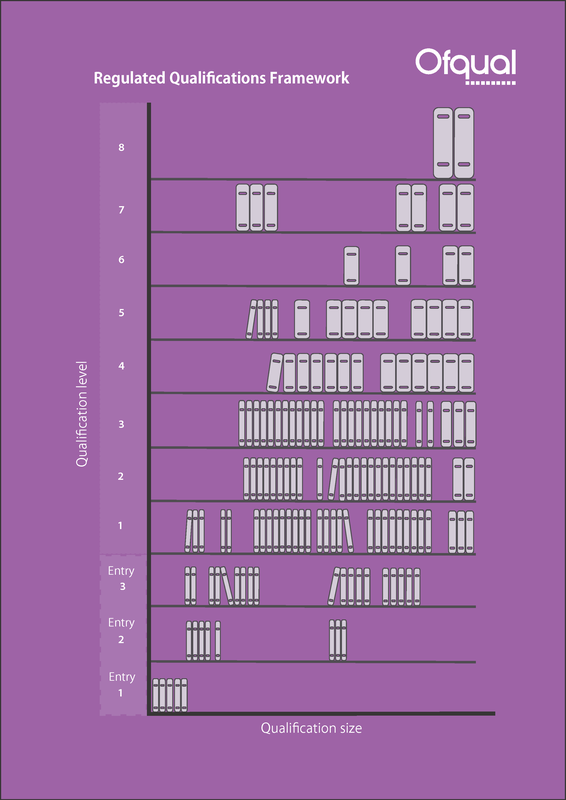 The framework will also show where a qualification sits in relation to others of differing level or size, like a range of books in a bookcase (see image below). Qualifications we run through our associated charity IoLET (IoL Educational Trust) are migrating to this new framework and any reference to QCF will gradually be removed from the qualification titles and documentation (by 31 December 2017). There is no change to the levels, credit values nor content of the existing IoLET qualifications. "The RQF provides a single, simple system for cataloguing all qualifications regulated by us. It's like a bookcase in a library, with qualifications indexed by their 'level' and 'size'. Qualifications at any specific level can be very different from one another, for example in their content and purpose. We maintain a register that provides more detail on each qualification (alpharegister.ofqual.gov.uk). Levels indicate the difficulty and complexity of the knowledge and skills associated with any qualification. There are eight levels supported by three 'entry' levels. While most qualifications will be assigned a single level some, such as GCSEs, can span more than one. Size refers to the estimated total amount of time it could typically take to study and be assessed for a qualification. This can be anything from a matter of hours to several years of study and different students can take different amounts of time to study for the same qualification. Size is expressed in terms of Total Qualification Time. The part of that time typically spent being taught or supervised, rather than studying alone, is known as Guided Learning Hours. Qualifications can sit at different levels, but require similar amounts of study and assessment time. Equally, qualifications at the same level can take different amounts of study and assessment time. The RQF replaces the Qualifications and Credit Framework, and National Qualifications Framework in October 2015".